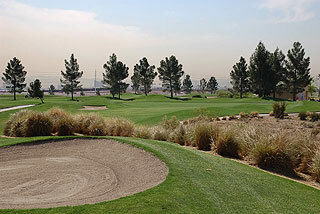 Marketed as "the worlds most complete golf experience", Angel Park in Summerlin features 2 championship 18-hole layouts, a twelve-hole par three, and an unique 18-hole putting course. 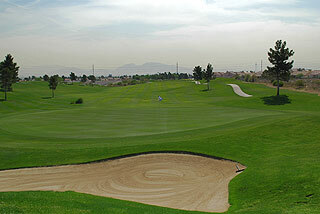 A large driving range, practice green and short game area are also on property. The driving range, putting course and 9 out of the 12 holes of the famous par three Cloud Nine Course are lit for night play. Just 15-20 minutes from McCarran International Airport and the Las Vegas Strip, Angel Park offers convenience, quality and variety unmatched in the Las Vegas area. 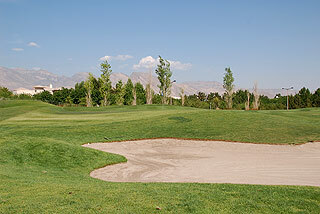 What's more, golf here is reasonably priced - with especially great rates offered to locals and frequent players. An extensive clubhouse with pro shop, restaurant and lounge, make this a complete experience. 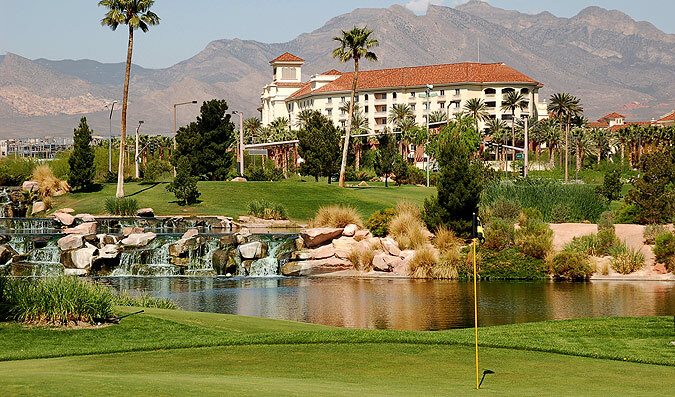 Accommodations at the incredible, upscale JW Marriott Golf and Casino Resort are available just across the street from the Angel Park complex, making a visit to Summerlin all the more convenient. On this visit, we had the opportunity to use their practice facilities, Putting Course, Cloud Nine par three, and played an 18-hole round on the championship Palm layout. 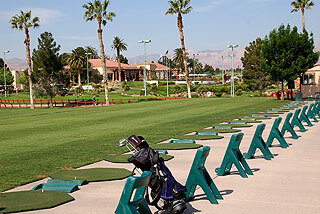 An endless supply of balls are provided for on their expansive driving range (mats), featuring ample target areas. At the opposite end of the range is practice facility for lessons and clinics. Our warm-up also consisted of a friendly match on the incredible 18-hole Putting Course. This is a great way to spend an hour or so - attempting to lag putts of outrageous distances and designs. Sand traps and a course-long water hazard combine with menacing undulations that will challenge even the most gifted putter. For groups and outings, this is a great venue for a friendly wager - or a major one (a Lexus was won on this putting course, at a private tournament hosted by Angel Park). Tigger and Sparky played for a brew! The Cloud Nine course presents some interesting holes, with a tee shot to an island green as a highlight. Elevated tees, elevated greens, water hazards, bunkers - all are featured in this one-of-a-kind facility, boasting concepts which are embodied in twelve of the most legendary golf courses from around the world. Par threes ranging in distances from 60 to 146 yards will challenge your iron play. The putting surfaces are out of the same mold as the championship courses. You can walk or ride a cart. This is a fun round for beginners and families - and great practice for experienced golfers. 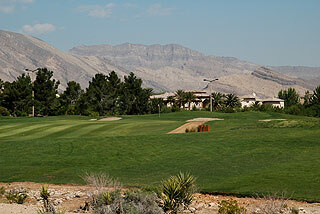 The Palms Course measures 6525 yards, with 4 sets of tees encouraging play from all levels of golfers. The mid tees play at 5857, with only 1 par four of 400+ yards in length. The opening hole doglegs to the left, with out of bounds stakes posted all along that side. Stay right on your approach, as the slope to the left will lead all shots hit on that side, towards the hazard. One club more will be necessary on the par three 2nd, which plays slightly uphill. Bunkers protect the green on both sides. The par four third is short and straight. Heed the ranger's advice - that all putts tend to break toward the strip - no matter how contrary this may appear. This information will come in handy on the third green. Another short par four features a carry off the tee over a desert wash, and a narrow approach with OB to the right. A tee shot over water to a double-tiered green will challenge you on the par 3 fifth. Perhaps the most interesting hole of the layout is next. This # 1 handicap gives you a choice of two fairways off the tee. The one to the left is the safe play, as the short cut demands extreme length to carry the desert and the fairway hill which will result in uneven lies for all shots that don't clear. 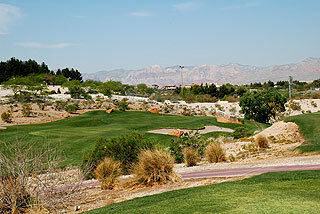 The seventh is also challenging, with a tee shot over more desert, and fairway bunkers on both sides. A grass ravine fronts the green and desert hazard looms right The eighth is almost all carry over water with a large bunker waiting for anything hit over the green. More water will steer you to the right side for the length of the hole on the short par four ninth. As with many of the holes on this short front side - accuracy and good iron/wedge play will determine your score here. The backside is quite a bit longer than the front, presenting ample opportunities for long hitters to strut their stuff. The tips play at over 3500 yards, with the mids at 3147. 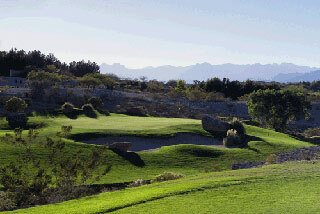 A downhill tee shot with a desert ravine along the right confronts you on number 10. Aim for the 150 stake - which is a quite visible feature on all the par fours and fives at Angel Park. This is the longest par four on the course. A dogleg left with an elevated green is next on the par 5 eleventh, and is followed by a downhill par three with considerable carry over desert. Play it safe and stay mid-left here. The tee shot on 13 must carry a water hazard, and is followed by a rather easy approach. Aim for the 150 off the tee for best results. Fourteen plays downhill of the tee and uphill the rest of the way. This is one of the best birdie opportunities on the course, though it is listed as the number 4 handicap. The four closing holes present the easiest sequence of the layout, providing a good chance for a strong finish. 15 is a short and easy par to an uphill green, and precedes another four par of similar length. Seventeen is a mid-length par three and is almost all carry over a ravine. The closing hole is straight, open and easy - the number 14th handicap. A green-side bunker long right is the only trouble you may encounter. 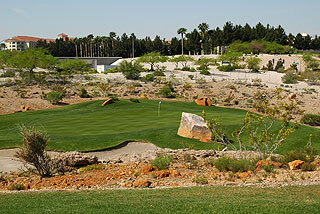 The Palm Course is a challenge from the professional tees, and an interesting round from the rest of the tee boxes. Quick greens demand accurate putting, and encourage you to stay below the hole on all approaches. The course is well marked, with 150-yard stakes in the fairways and yardage markers on sprinkler heads. Red, white and blue flags denote day's pin placement (Front, center, back). Ice chests are standard on all carts. We enjoyed a great and reasonably priced lunch while we were there. We found the service left nothing to be desired. Everyone from the bag drop to the rangers provided friendly, courteous, attentive service - and let it be known that they enjoyed their jobs at Angel Park. No wonder this is a local favorite. It is worth the 20 minute drive from the strip. Remember, if the tables are not treating you well, you can venture out here for a night game or practice. Call for seasonal hours. For more information on OB Sports and their properties - click here.